Leaflet allows you to do the basics, of course, such as popup an information window and overlay your own data. It can do far more than that and is a viable replacement for Google Maps. The functionality brought by Jason Sanford’s Leaflet Vector Layers is a real selling point for me. Geocommons are ArcGIS Online are two easy ways for people to get their data on the web. Leaflet Vector Layers then makes pulling that data into a web map simple. The Vector Layers plugin also makes Arc2Earth data available to you. Arc2Earth is a great tool for helping you move your data off of the desktop on to a cloud-based service. They have been doing some amazing work with storing geospatial data in Google Fusion Tables. 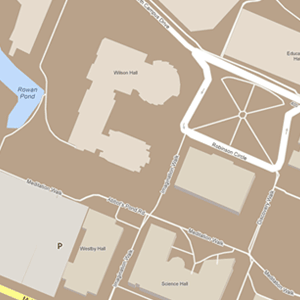 However you share your data on the web, Leaflet can bring it in to a web map and display it. If it’s easy to code and produces something that is easy to use and aesthetically pleasing, it’s going to be a big success. 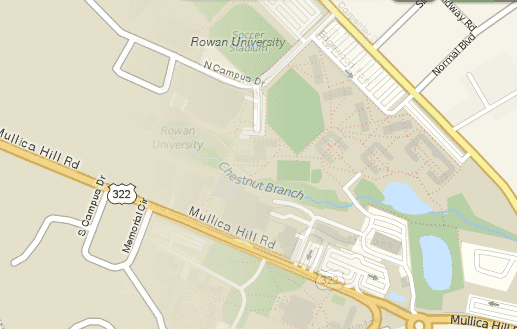 I am working on a project at Rowan where we are looking to make an interactive campus map that will zoom down to the room level, displaying floor plans of the buildings on campus. The flexibility and the cross-platform functionality of Leaflet means that I will seriously consider using this Library to power the user interface of the map. I was originally thinking about OpenLayers, but Leaflet seems powerful enough to do all that I require. Hat tip to Andrew Turner for the pointer to Leaflet Vector Layers. Posted: January 30, 2012 | Author: John Reiser | Filed under: Application Programming Interfaces | Tags: apis, mapquest, mapstraction, openstreetmap | Comments Off on Long Live Mapquest! Mapquest, the granddaddy of web mapping platforms, has been losing market share ever since Google Maps burst on to the scene. Google Maps’ tile-based (aka “slippy”) map interface and API caused many to adopt Google’s offering over Mapquest for integration with web sites as well as for daily use. 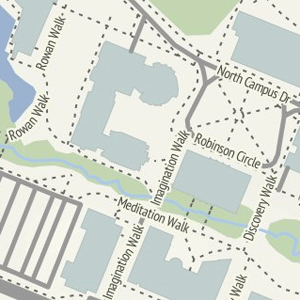 Mapquest has since turned over a new leaf and is offering a tiled map based off of OpenStreetMap data. Announced in 2010, the OSM-sourced map is just one of a few developer-friendly moves the company has recently made. Closed-source Mapquest on the left and OpenStreetMap-sourced tiles on the right. If you want to get started using Mapquest maps in your blog or personal web page, they have a simple to understand page on how construct your map using their Map Builder application. You can then embed maps into your WordPress blog using their plugin. If you want something more advanced, you can use their Open APIs to incorporate their OSM tiles and data into your application. And if you don’t want to use Mapquest’s API as the framework for building your application, you can always use the Mapstraction library and still use the tiles and some of their other data services. R. Buckminster Fuller was truly a modern Renaissance Man. Bucky created many inventions and championed several ideas that have shaped the way we live. One of his creations is the Dymaxion map projection. The map projection is rather complex; the developable surface is an icosahedron. 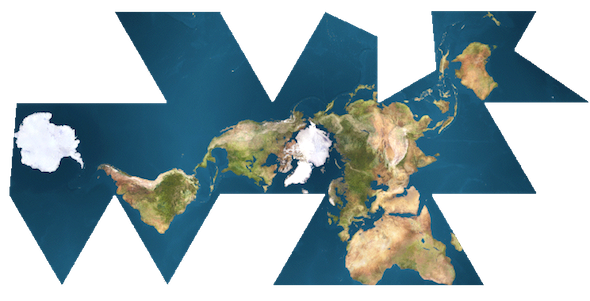 When the icosahedron is then sliced and flattened, it produces a world map that is visually intriguing. It is truly unlike any other map projection. In Zachary’s post, he also mentions the Faumaxion web map, which is a Flash-based web map that reorients itself so that north is at the top for any of the triangular faces of the Dymaxion projection. Michal Migurski, a partner at Stamen Design, has the details on how he created the Dymaxion slippy map. The downside to using a Dymaxion projection in your web map is that the support for the projection amongst the mapping APIs is minimal. You will need to do more of the heavy lifting in order to get this projection working properly in your web map. That’s also ignoring the fact that many people are not spatially aware and that this different projection will require your audience to orient themselves with the way the Earth has been projected. While Spherical Mercator is common and familiar, it does grossly exaggerate the areas closer to the poles, which in turn distorts your mapped data. Choropleth maps depicting a variable dependent on area, such as population density, are often misleading when mapped with a Mercator projection. The Dymaxion map is closer to an equal-area map than most, however the variable orientation towards North makes this projection a hard sell to a general audience. If you have no experience with web mapping, but have some basic website-building experience, you can begin to make interactive web maps fairly easily using Google’s mapping application programming interfaces (APIs).